A little web search will quickly reveal how passionate some folks are about their smokers. We have always used our Weber kettle grill for smoking, but I woke up on Monday and said, I'm buying a smoker for Chris today. Like anything I decide to buy for Chris, I ask him about it first. After two decades, yes that's two, of knowing him, I know my success rate in purchases for him is still maybe 5% at best. I did my requisite research on the internet and with friends. In the end, Chris said go Weber for sure. 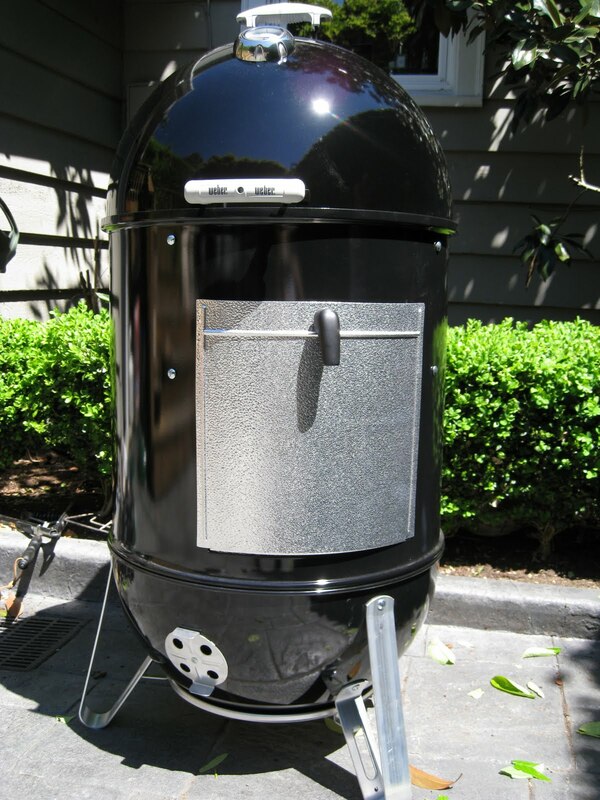 Weber offers a 18.5" and 22.5" smoker. After a little rather logical discussion, he decided the 18.5" would be just fine. It arrived on Thursday, I diligently assembled it and set it outside and thought to myself with a little cringe, he is going to want the bigger one. In anticipation of receiving his new toy, he did a little researching himself and discovered the customizations some folks have done to their smokers. 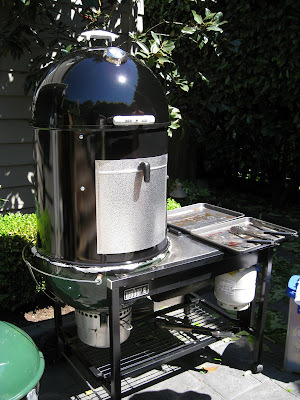 The one that changed our course was taking the body of the smoker and setting it on top of the kettle grill. We have an old Performer Grill which is set into a cart that provides storage and a work top on the side on the grill. Being able to roll the smoker around and have a work surface drove the decision to go out and get the 22.5" smoker. It is only 4" wider, but it seems massive. I mean how many times will we ever need a smoker that big? The coal consumption is 1.5 times more than the smaller model. It's another huge item to store in our back yard. Throw all logic aside, and welcome home the purchase made with emotion. A new baby has arrived. So, it's a stellar Saturday in Seattle. I made it through the dreary week based on the promise of a beautiful sunny weekend and it's been delivered. 9:00 am, watched the womens French Open finals, showered, coffeed, and then it was time to lay out the timeline for taking the new Weber for a test drive. For the first smoke, it is ribs of course. I bought a 3 pack of pork back ribs from Costco and a slab of beef ribs from Uwajimaya who always seems to come through for me. A few chicken drumsticks and a whole chicken will also make their way onto the smoker. But, for today's posting, let's focus on the ribs. Spread the brown sugar out on a baking sheet to dry out a bit. Mix all ingredients together. The rub recipe makes more than enough to save for future uses. Two hours before you are ready to cook, take the ribs out and using a sharp filet knife, remove the membrane on the back of the ribs and any excess fat. Apply a light dusting of the rub on the ribs, both sides. Do not over apply the rub or they will be too salty. Let the ribs sit at room temperature for two hours. Meanwhile prepare the grill. The whole smoking process will take 10-15 lbs of coal and 6 large chunks of hardwood, we used applewood, with the bark removed. 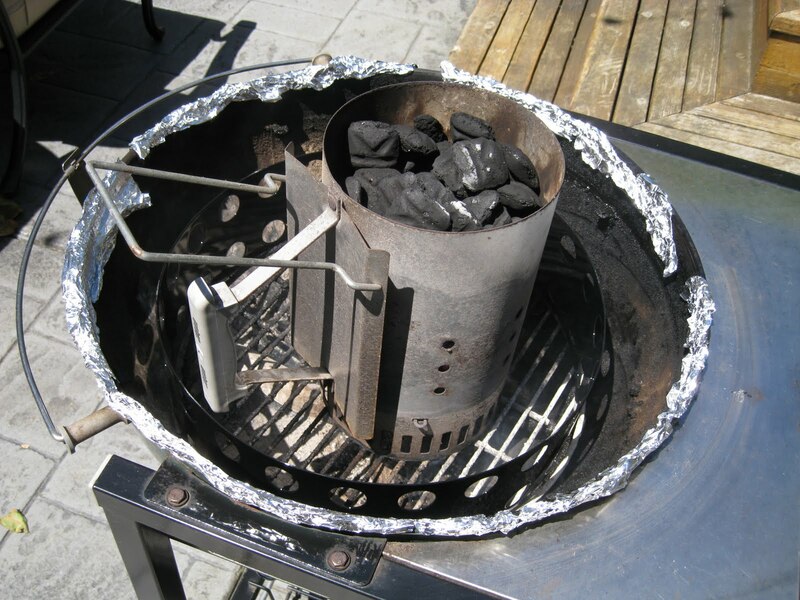 Fill a charcoal chimney to the top. Light the charcoal and once the coals are lit, dump them into the charcoal chamber of the smoker or in our case the kettle. Then refill the chimney and light another round of charcoal. When those are lit add them to the pile, spread out the charcoal a little and add the applewood chunks to it. Once the applewood starts to burn, assemble the smoker on top. Fill the water pan with cool water. According to Weber, this helps to keep the temperature of the smoker down. Check the water level via the side door of the smoker every 90 minutes or so and add water as needed. Adjust the vents to maintain a temp of 225f for the first 3 hours. We closed all the vents for the first couple of hours. Continue smoking for another hour and begin to check for doneness. We wound up smoking the ribs for a total 5 hours. After the initial 3 hours, we added coals to help maintain the higher temperature. Saute the onions and garlic in a little oil until softened. Put in a blender with remaining ingredients and puree. Return to a large sauce pan and bring to a simmer for 15 minutes. Let cool to room temp. 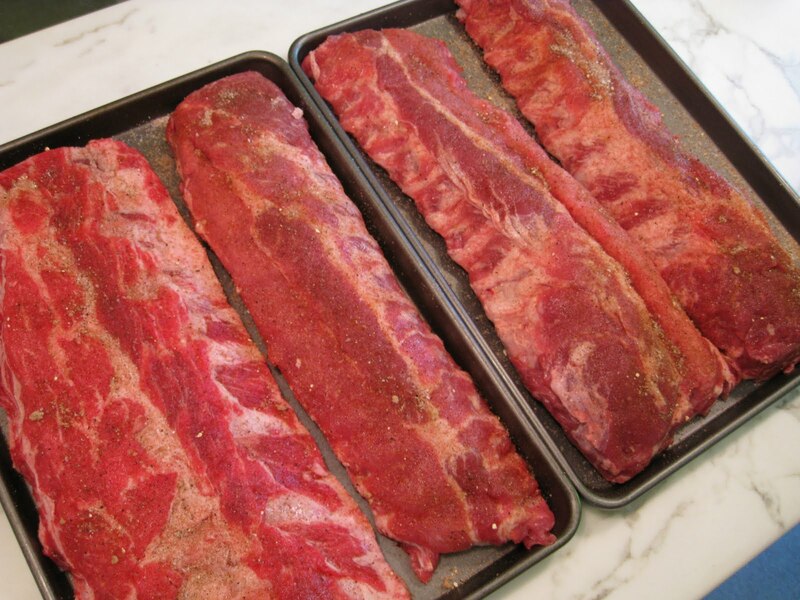 Cut ribs into sections and serve with the barbecue sauce on the side along with your favorite barbecue accompaniments. I did baked beans, cornbread, roasted potatoes and a caprese salad. A complete failure on my part to not get any photos of the ribs in their complete beautiful form after smoking. Chatting with friends trumped blogging.... as it should any good day. Add in a couple of good cocktails and a proper photo shoot never even crossed my mind... until it was too late. The ribs were delicious. The beef may have out-shined the pork. More flavor. The larger weber is a beast of a smoker. Time will tell if its size winds up being a deterrent to smoking at will. But it sure was fun. what a spectacular smoker! When I first saw the picture I thought you guys had pieced together a still in the backyard.